We’ll start ending the year with a big ol’ shout-out to Big Tractor Mike. 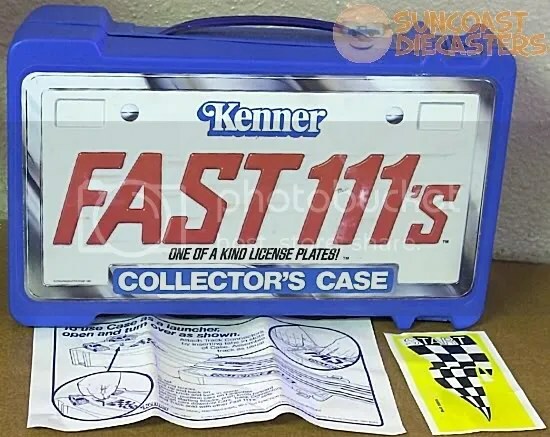 I have no idea where he finded this Kenner Fast111s collector case in such excellent condition. 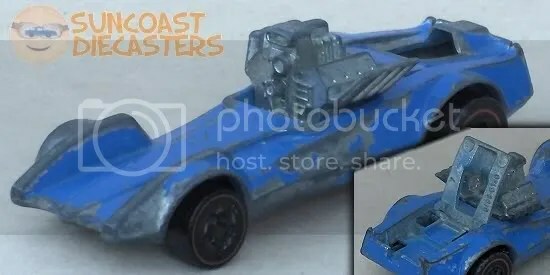 But seeing as how I am Suncoast Diecasters‘ de facto Fast111s collector, and such an accessory (especially in such fine shape) is rare indeed — not to mention the fact that I just plain need more storage — I was more than happy to brighten BTM’s holiday by dropping some green for this blue. To prove the point about needing more storage, here I cause myself to need even more more storage. Counter-clockwise from lower right: Lola T260 by Summer, courtesy Big Tractor Mike. 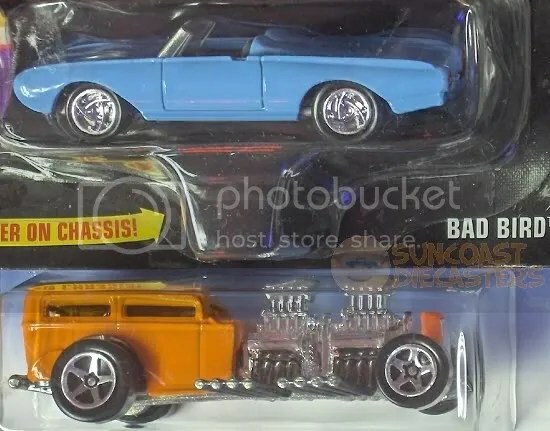 I was very much surprised not only to find a second Lola, but to find it in a color scheme entirely different from the one I got in July ’09; Austin Healey and Shelby Cobra 427 S/C (also more blandly known as “Classic Cobra”) in very nice “Team Hot Wheels” livery, from Ed (yes, good ol’ Ed was able to attend our final 2011 gathering); and from Ken, two T-Totallers and, praise the Lord, someting I thought I’d never own: a Flat Out 442, and in really nice condition. I love Christmas! 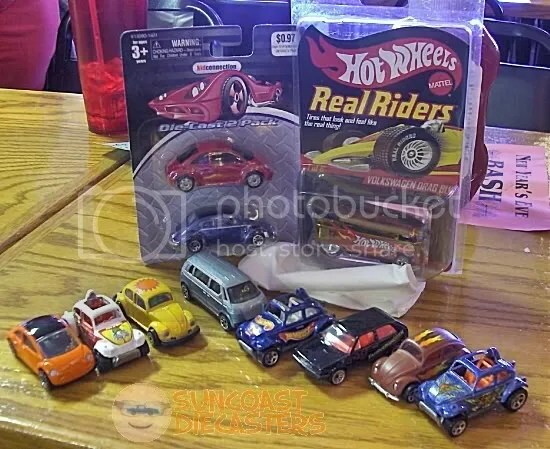 “Hot Ones”-series reissue Sunagon, courtesy Steve. Admittedly, the reissuing of this series is primarily a marketig gimmick by Mattel, much as it was with the Classics and Since ’68 series. But let’s look at it another way: if you wanted an older model such as Sunagon, first of all good luck finding one. Second, if it was in any degree of decent condition, it would very pricey. In contrast, if it was affordable (relatively speaking), you know it’d have to be pretty beat up. 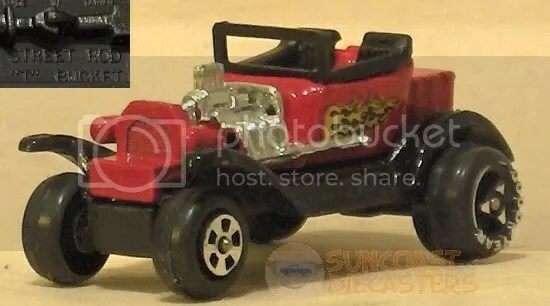 So, gimmick series such as this are a way to collect older, more rare models. Granted, not likely to have high resale value like an original (then again, who can predict the collectibles market? ); but, hey, the primary fun in collecting is, duh, the collecting, the acquiring of an item. High-dollar resale fun only comes much, much later, after all. (Sigh.) No doubt you’ve heard the sad and unfortunate news that Sears Amalgamated Conglomerated (Nasdaq symbol: SUNK) may close over one hundred Sears and K-Mart stores. Yet there was a time when Sears was in fact a very popular place to shop. And by “popular”, I mean “even kids, too”. I recall my teen years when my high school / military buddy Jeff and I would head out to the mall on weekends, and one of the stores we would readily frequent was Sears, because it had a rockin’ toy department. (Yes, we were immature enough to still want to hang out in the toy section.) 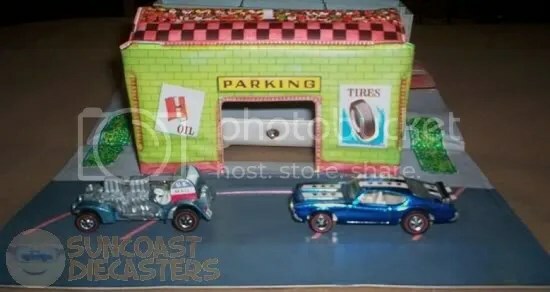 And for those of you who can’t believe that stodgy ol’ Sears ever even had a toy section, here’s proof fom Bob that Sears, at some point during its history, took the “small diecast cars” market seriously enough to offer its own branded line. 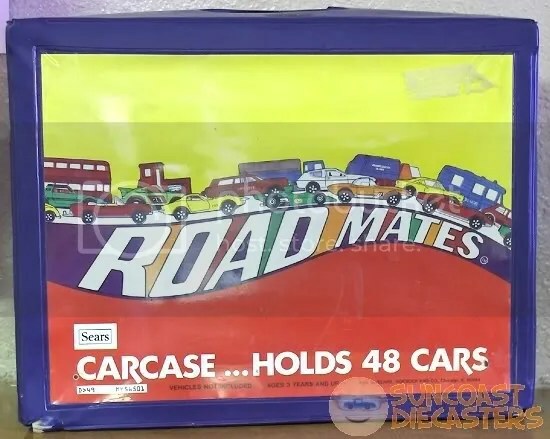 Road Mates cars were actually Playart products, custom-packaged for Sears. 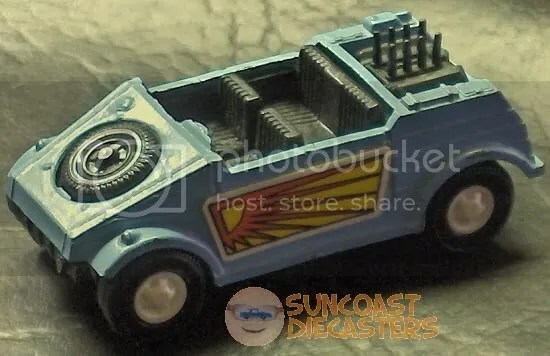 (Scope out the Febuary section of our 2009 Gallery for a pic of a MOC Road Mates Rolls.) This is why collecting is important, not just fun: The Sears and K-Mart brands are facing financial hardship, and one or both of those names may eventually disappear from the American fabric. 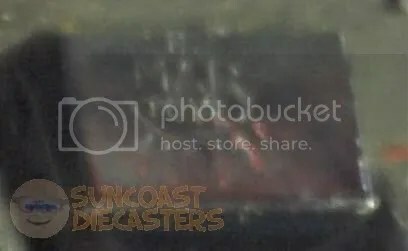 This particular line, Road Mates, disappeared long ago, and exists now only in the hand of collectors and in online documentation such as this club site. Formerly well-known American names such as McCroy, Woolworth and Kenner are gone. It becomes, I think, a kind of obligation to those of us who fondly recall such elements of Americana to make at least some sort of statement about them. Our resident Volkswagen-o-phile, Tom, greatly increased his collection at our December meeting. Further, the Holiday spirit was clearly in evidence: several of the cars in this photo were RAOK’d to him by various club members. Let there be festivity! Ken wraps up the year by goin’ big, goin’ large, goin’ supah-sized! Reaching a whole new level in garbage truckery, Ken outdoes hisself with this whopping 1:43-scale monster machine. 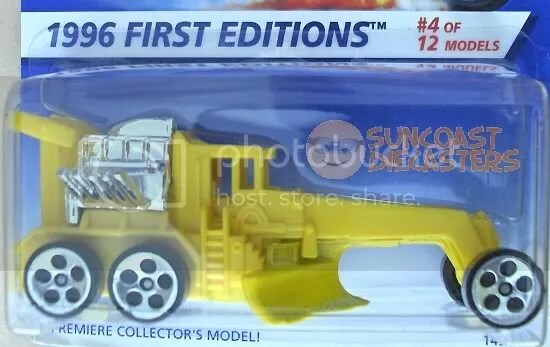 I can’t wait to see what next year holds for The Hunt for the Ultimate Garbage Truck®. Once again, Bill proves himself to be the Viscount of Variations. Tom picked up a sweet pair of half a quartet of awesome Special Editions. The ‘bus looks all nice n’ professional, while the White tanker is seriously heavy both in actual physical weight and in design execution. Tom claims to be “into” Volswagens. Yeah, sure. The photo below doesn’t prove a thing. We don’t have many rules at Suncoast Diecasters. (Yet I still can’t convince Mike or Ken to let me post them here on the site!) One of our few rules is, all items must be available for trade or purchase; nothing is allowed “just for show.” Well, Joe done broke that rule, to everyone’s enjoyment. Below is the Matchbox Combat Zone playset (circa 1976). A true classic not only because of its age, but also because it’s from a time when toys and playsets didn’t have electronic chips which contain “authentic sounds and dialog!”, a time when fun was powered strictly by a child’s imagination. 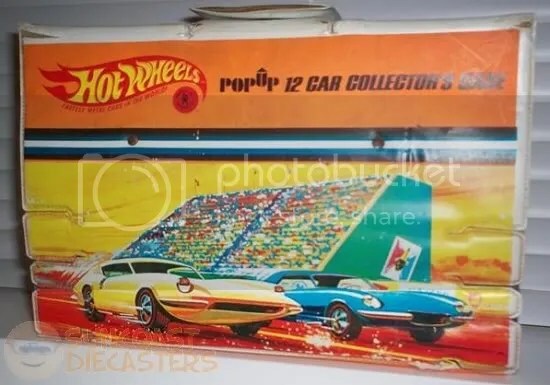 Joe continued to be a scofflaw, showing off this excellent Hot Wheels playset. 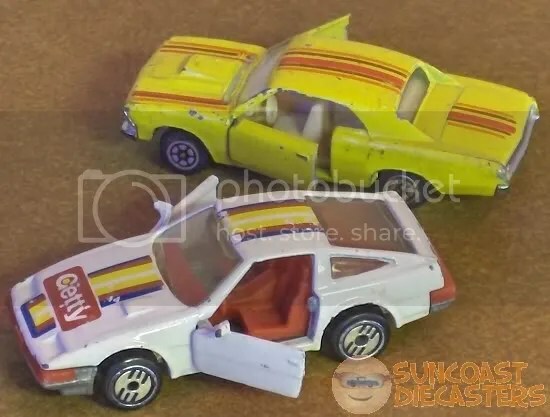 Perhaps you’ve seen the cars, exclusive to this set, in Bill’s gallery. Well, here be the whole set upon which to feast your eyes upon. Which. (Sigh.) 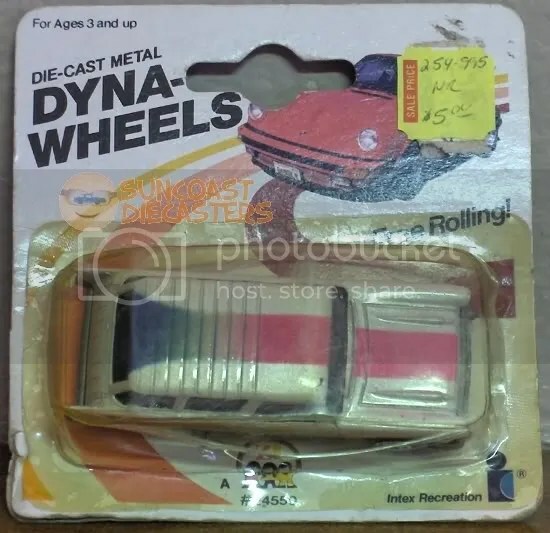 Not only are its cars still hermetically sealed in their 1976 HazMat suits, it even still has the delighfully cartoonish “missing parts” reorder form. Mike C. scored some serious Redline action with these. Top photo: Heavyweights Ambulance; Splittin’ Image; Jack Rabbit Special. Bottom photo: Lotus Turbine; Rolls Royce Silver Shadow; Mercedes Benz 280 SL; Peeping Bomb. 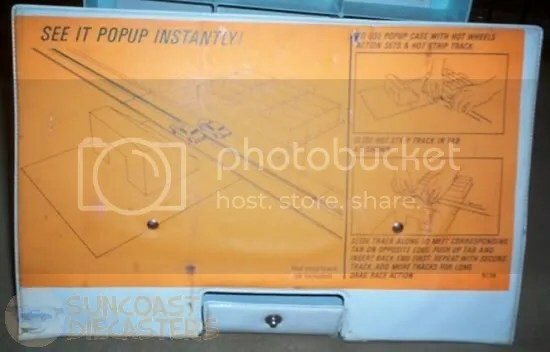 Mike C. picked up from Jim this fantabulous retro goodie: the PopUp 12 Car Collector Case. Had it just been more storage, that would’ve been cool enough — bot it’s oh so much more than that! Hey, look: a couple o’ douchebag parkers. Car storage and a rally audience accessory, all in one. 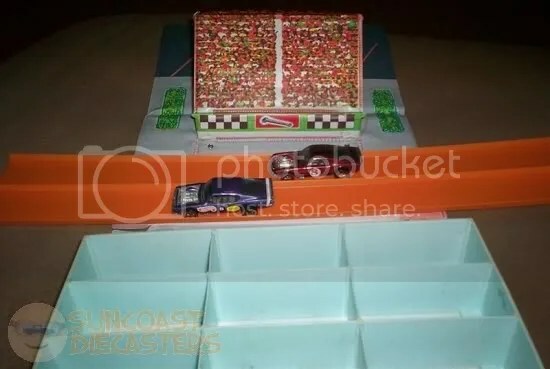 If this had been designed to also hold a Super Charger and an oval of track, it would’ve been completely complete! Marge continued her “Each Car for a Dollar” sale, and amongst the goodies I spotted this A-OK. It’s in better condition than my other one, and for a dollar there’s no way I could pass this up. Like many people, when I first saw photos of the new Batmobile for Batman Begins my initial reaction was “Are you kidding me?!? 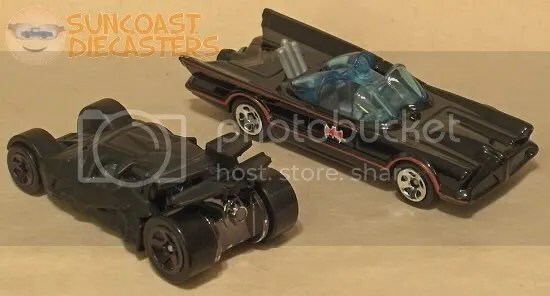 ; the Batmobile is supposed to be sleek and stylishly spooky, not this chunky tank-thing!” Then I eventually watched the movie on cable, and I was impressed, enough to change my mind. I had several times considered buying the 2-pack just to get the Tumbler, but I couldn’t bring m’self to drop the 6 bucks. Eventually the 2-pack went away, and I resigned myself to never owning it. Eh, I sour-graped, wrong scale anyway. But when it appeared amongst the other cars in Marge’s sale, I realized I should grab the opportunity (and the Tumbler). Now, with this photo you might tend to agree with me about it being the wrong scale. However … According this this entry at Wikipedia, which is never wrong , the TV Batmobile is 226″ long, which is 18′-10″, while the Tumbler is 15′ long — neary four feet shorter than the ’66. So, this photo is not so out of scale after all! Oh me, oh my. Jim was selling his collection to shrink it, not to make (too much) profit. I inquired about this classic, and he responded with An Embarrassingly Low Price® (darn near peg price, in fact). Oh, how I could not pass this up. With Red Baron, Paddy Wagon, Tijuana Taxi and Ice-T, this makes my Tom Daniel 1/43 collection complete. Without a doubt, a design success for Daniel, and a licensing victory for Mattel. Bet you’ve never seen this clear a view of Bus’ interior! 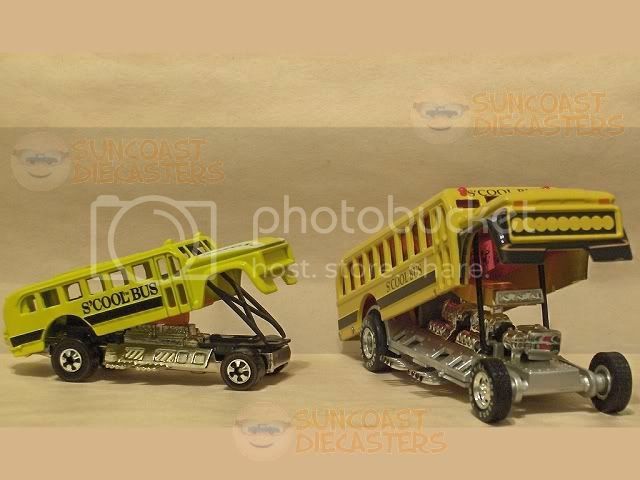 Another patented Suncoast Diecasters Two-Scale® shot for ya. Oooh, yeah. You want it, and you want it big. Be greedy and choose the biggest size your monitor can handle from the choices below the pic. 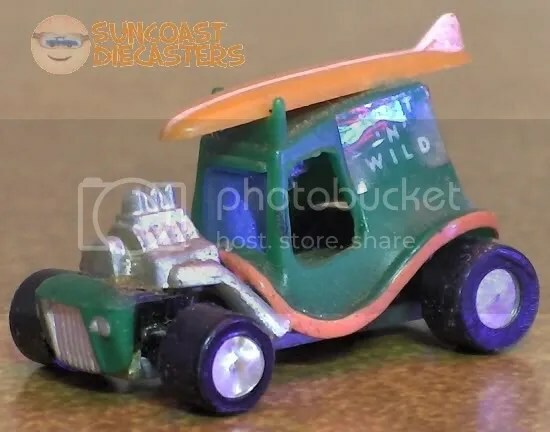 Greg had a “Priced to Move” sale: everything down to $1.00/ea., including the cars that clearly were in the “above a dollar” realm. 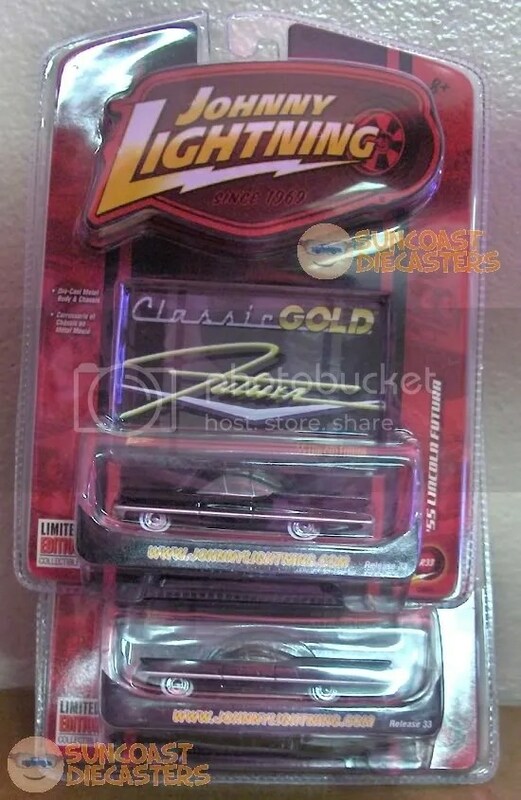 I grabbed this Johnny Lightning Bad Bird because I couldn’t (and can’t) recall if I already have one. Yes, I bought it just in case. Bought the Way2 Fast because, well, one can never too many Way 2 Fastses. Ken scores big mighty mighty with this outrageously retro find from the classic tin toy era. I’d take this over something from Greenlight or M2 Machines any day. I apologize for not having a better image of the logo. Ken supposed it to be Marx; the “mar” is clearly visible, surrounded by what seems to be a stylized sunburst … but where’s the x? Well, thanks to the Internet, which is never wrong, it turns out this is a Marx toy. Back in the day, the Marx logo was in fact just “MAR” over a circle — which had an X inside it, essentially hidden behind the rest of the word. It was Ladies’ Choice (apparently), as Krista and her friend chose these eight cars o’ mine. Clockwise from bottom left: Mystery Rigor Motor; GTO (I think) from Dollar Tree; Mystery Thunderbird; ’63 Mustang II Concept; Straight Pipes; Howlin’ Heat; Talbot Lago; and centerstage is Mystery Ford Mustang GT Concept. 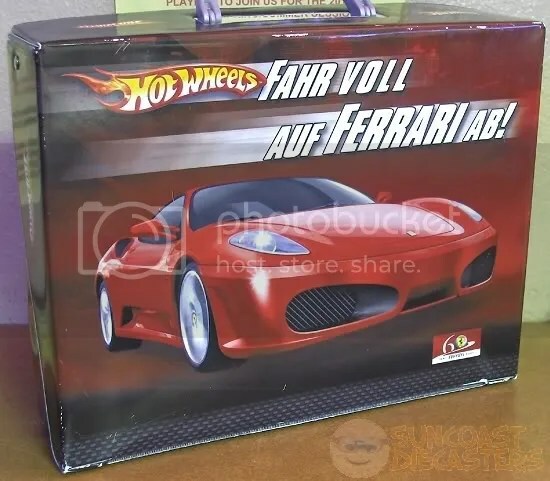 Joe brought in this sehr coolishe German-edition o-fishull Hot Wheels collector case which celebrates Ferrari’s 60th anniversary. Many pretty pictures of Ferrari models all along the sides. 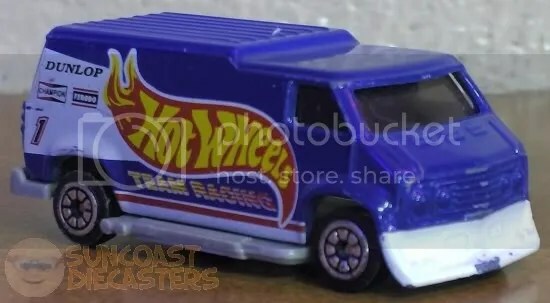 From Joe I bough this way-cool Hot Wheels Custom Van. 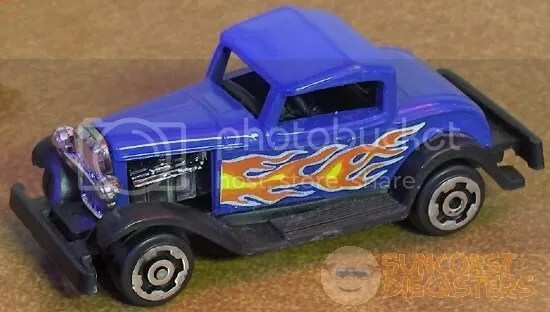 Dig the “Hot Wheels Blue” blue! 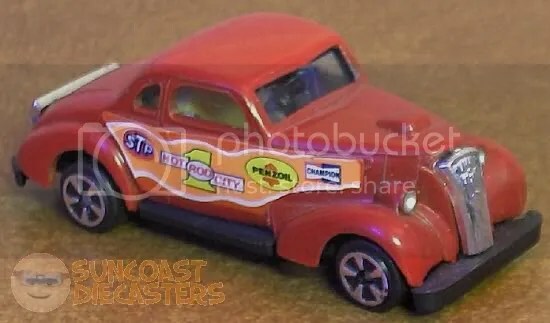 Dig the flaming Hot Wheels flame logo! Dig those Real Rider– …Wait a minute…. Okay, I’ll be straight-up with you: I have no idea what the heck is going on here. From Big Tractor Mike I bought this exceptionally groovy old-skooler. For those of you who have concerns about a trademark violation, “t-bucket” is style, not a brand. Man, this is hep. Very nice. Standin’ a bit tall for a T, perhaps, but cool just the same. 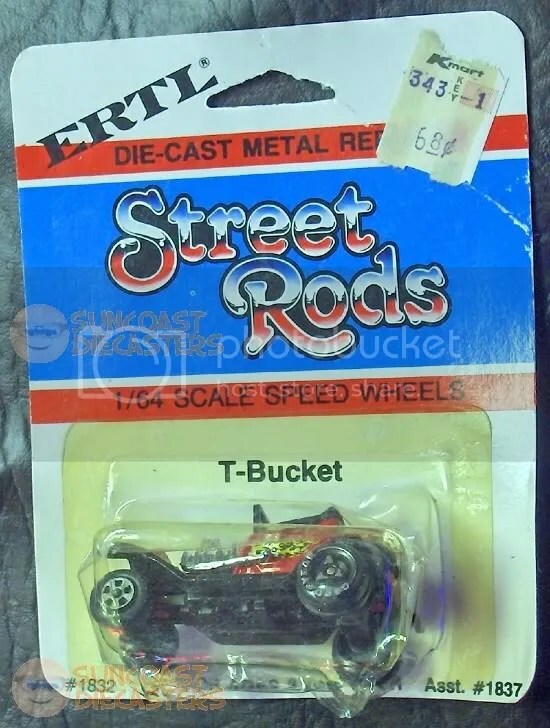 Possible naming error in the inset: don’t know if it’s actually named “Street Rod “T” Bucket”, or if “Street Rod” here refers to the model series. Thoughtful of ERTL to cast a nice universal joint, though! Yeah, it has that T-bucketty look to it. Thanks, Mike — this ride’s the ginchiest! Ed made a rare and much-appreciated appearance at the July meeting. Below is the first of three cars I bought from him. 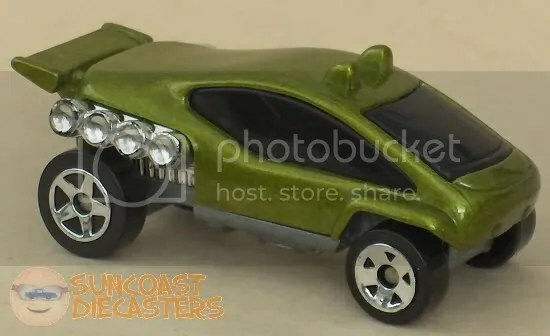 This is Hot Wheels’ Trail Runner, from 1999. What’s that you say? 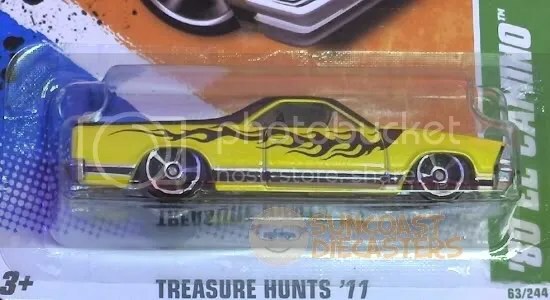 You don’t remember seeing this model on the pegs in ’99? Well, that’s because this was only available in a McDonald’s Happy Meal! 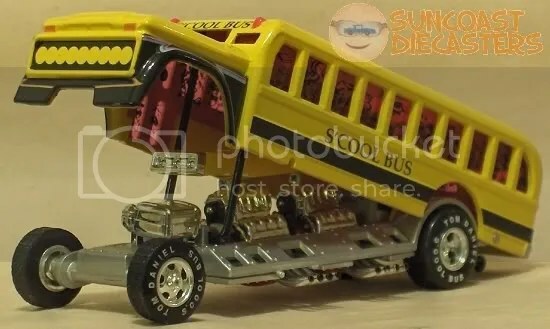 I have several of the ’99 series vehicles, and I cannot understand why they were never offered as mainline vehicles. All but two of that series were, IMHO, sufficiently imaginative and well-crafted to warrant peg-worthiness. And this here is my best purchase: the 1973 Strip Teaser. Believe it or else, Ed had his in his “Make an Offer” box. 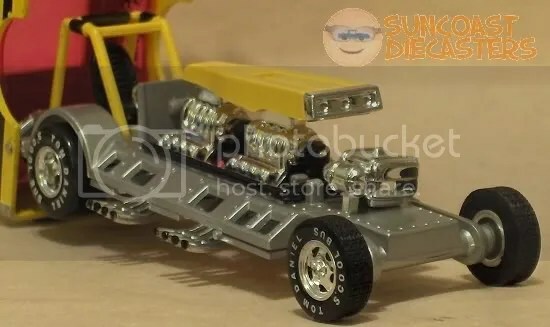 Well, I made an offer, he accepted it, and I got myself a very rare Redline-era model for (say it with me now) an embarrassingly low price. How rare, you ask? 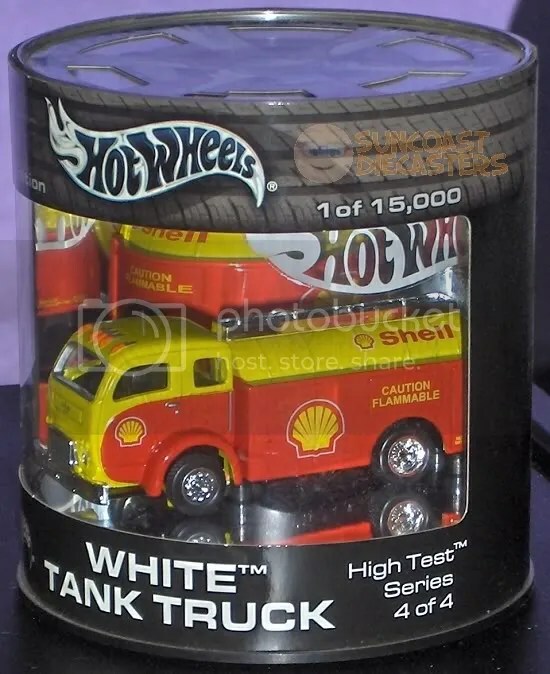 Well, per the Hot Wheels Wiki, it was only on the pegs in 1971, then rereleased in ’73 for a Shell promo. 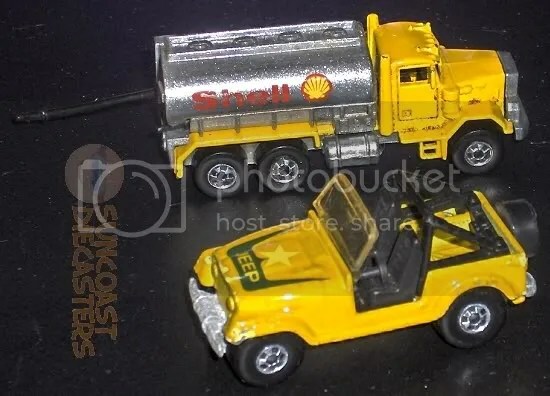 The Wiki illustrates the ’71 model as Sprectraflame, and the ’73 as enamel; this is clearly enamel, so this is a Shell promo version. 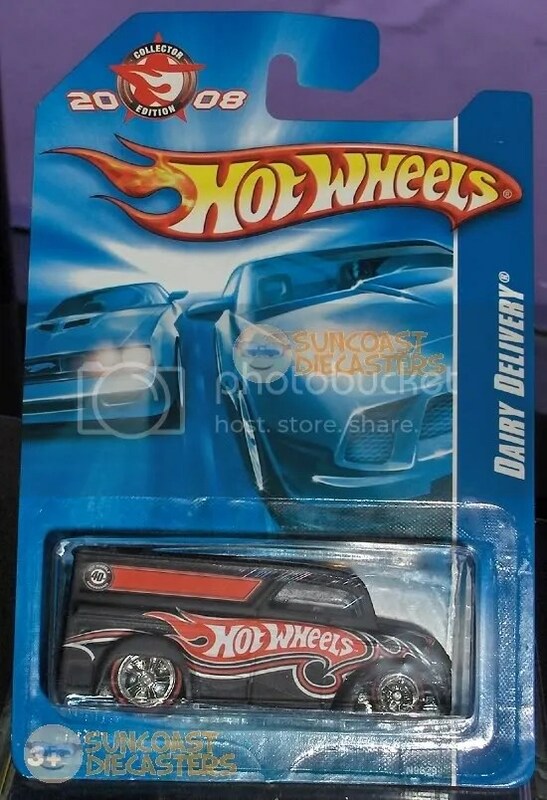 Yes, as you can see in the inset, the plastic interior is missing; no, I don’t care — I have a rare Redline model! Thanks, Ed! Gotta give a big ol’ super-size shout-out to Big Tractor Mike (not to mention a heartfelt thank-you to my Lord Yeshua) for this amazing find. 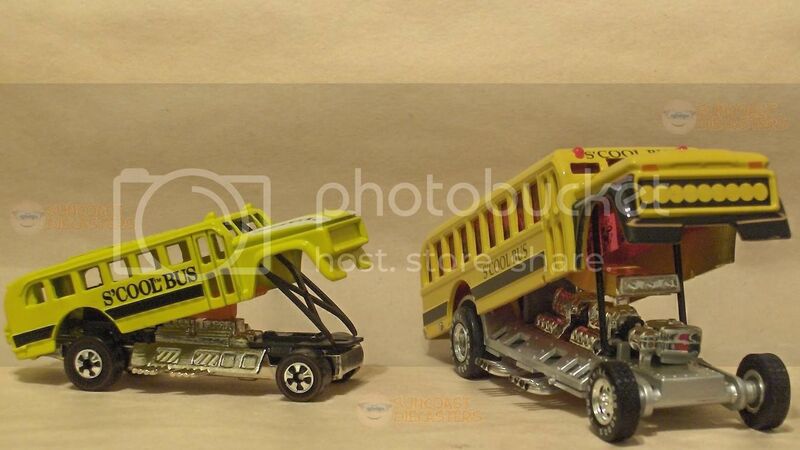 This is in fact a Kenner Fast111s still on the card. This is something I never thought I’d see, much less own. 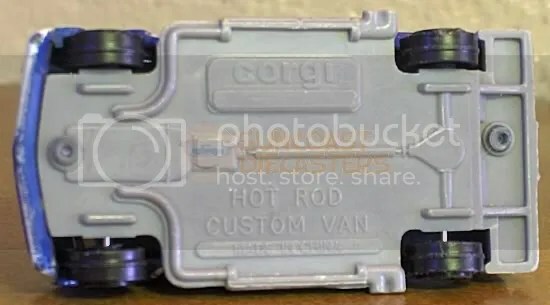 You might find it odd that what looks like a typical ’70s-era custom van is named “Emergency Van”. 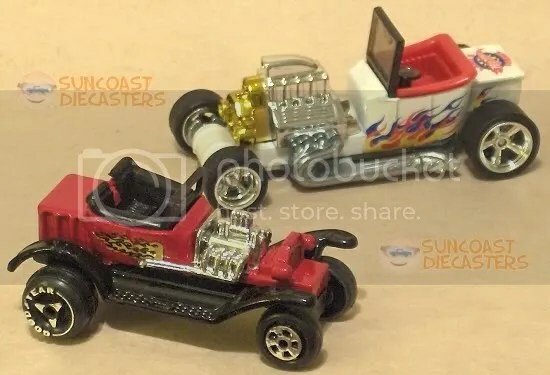 Simple explanation: same model, redeco’d, wrong blister. And, yes, I now have this safely stored in a Kar Keeper. By the way, with this aquisition, BTM has set a new bar for Embarrassingly Low Price®. Okay, you might be sayin’, “Dog! What’s with the teeny tiny thumbnail after starting off with that nice big first photo! ?” I’m such a tease. 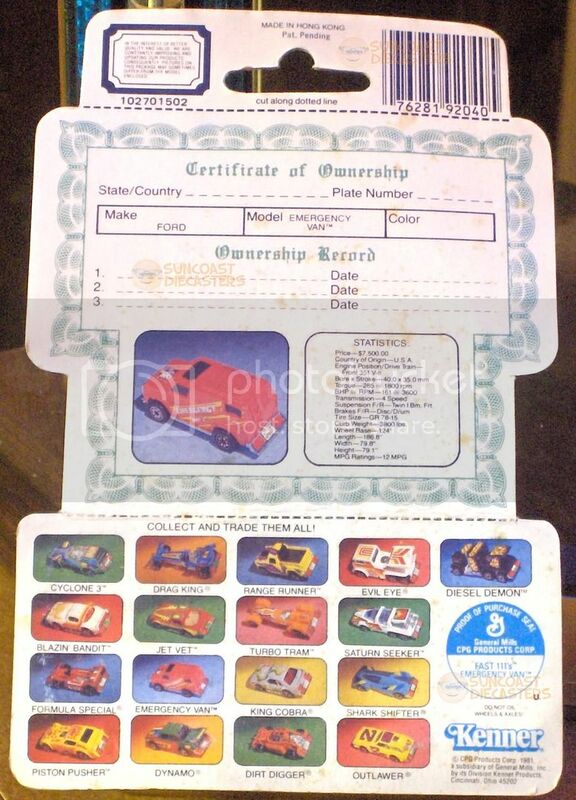 One of Fast111s‘ gimmicks was the Certificate of Ownership on the card reverse. 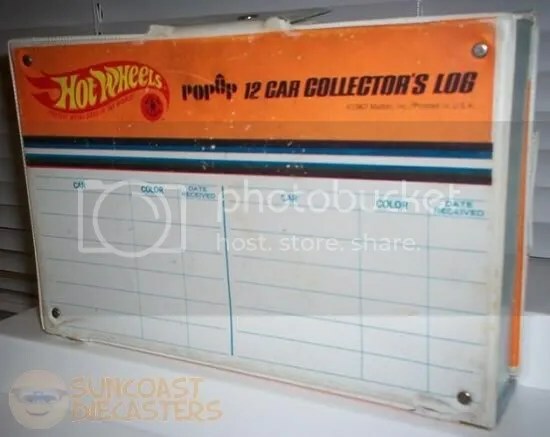 Framed with a fancy scroll border, the CoO was kinda like a kid-size Title, and even included “real world” stats for each vehicle. Not to mention the handy model listing at the bottom. Click the thumbnail for a overize version from which you may drink in the details (1043w x1449h x 941kb). Another shout-out to Big Tractor Mike. 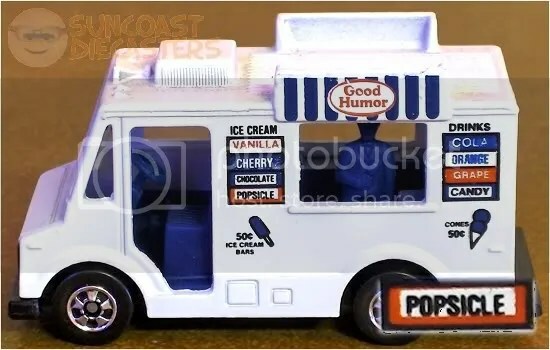 This is the rare first-edition Ice Cream Truck, which featured the Popsicle name (as you can see in the insert). Mattel had to correct this because, surprise, Popsicle was not a flavor or a “generic” industry term. No, Popsicle was its own company — Oops! ‘Course, all this is academic now, as both companies are currently owned by Unilever. Whoof. Kenny really reeks it up this month with some stanky bookending. 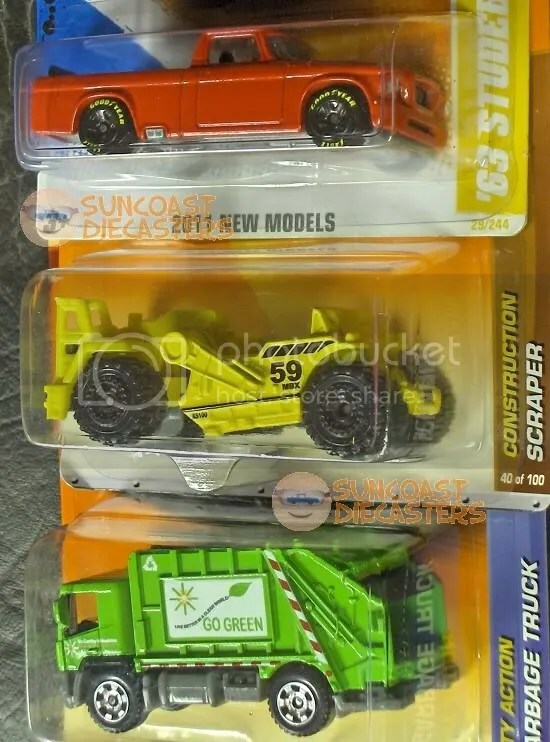 We start with this trio (yes, trio) of gen-u-ine garbage trucks. The two in back are Maisto (yes, the Tonka is a Maisto). The one in front is Yatming. 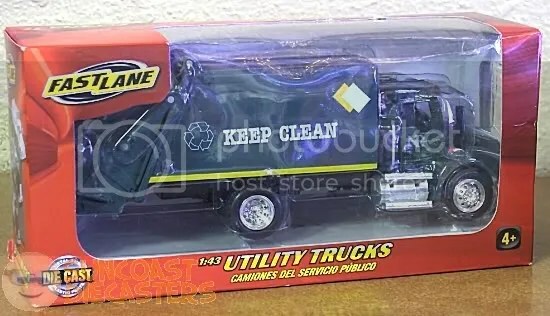 Interesting point: eventually, toy cars end up in garbage trucks. Ken’s collection consists primarily of garbage trucks. That lends a sort of “meta” essence to his collection, don’tcha think? I told Ken that I became suspicious when I saw this labeled as a 1980 El Camino. I figgered Chevy stopped making El Cams in the early or mid 70s. However, a Wikipedia article states that El Cams were in production as late 1987. And if there’s one thing the Internet has taught us, it’s that Wikipedia is always 100% correct. Always. Ken’s collecting passions fall into three main categories: 1) garbage truck; 2) Willys; and 3) rare and/or international brand. This Porsche 935 Turbo is by Faie (actually says so on the base, which per Ken is quite rare). 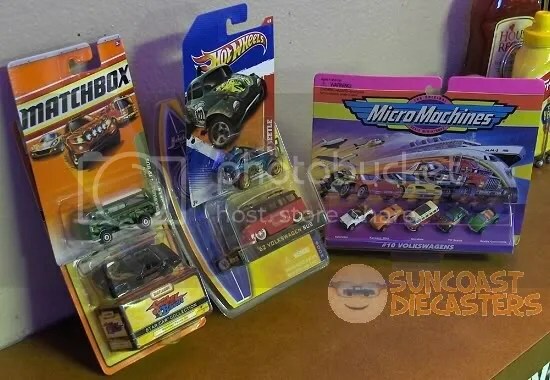 And that’s pretty much all I can tell you; other than a collector’s website which describes Faie as “imitation Tomica”, there’s just not a lot of info out there about the brand. Aaaand here is Ken’s other stinky bookend. If you’ve ever read Stephen King’s Christine, perhaps you’ll recall that the final confrontation featured an entirely different sort of vehicle, one which King’s characters described quite efficiently: “ca-ca sucker”. Yep, this is that: a septic tanker truck. And it does exactly what you think it does. By the way, just for your edification, the model is specifically a Toyota Dyna; more specifically, from the RU10 series, I think. 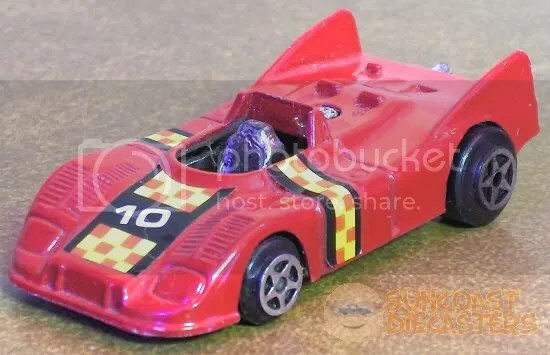 Have to give credit to Tomica: if the goal was to produce the unlikeliest of miniatures, that goal has certainly been achieved. 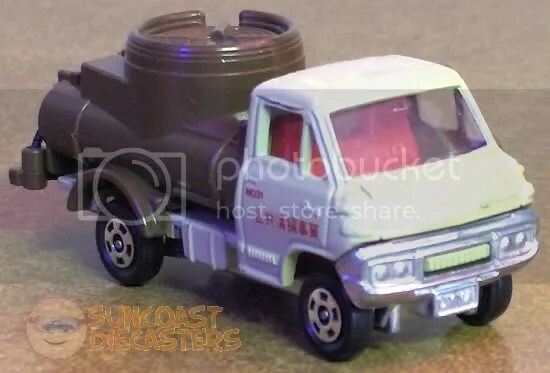 Have to give Tomica credit here, too: they didn’t skimp on the hoses. Could’ve been simple relief-molds on the body surface; could’ve been smooth rather than segmented. Could’ve been not there at all. Instead, they decided to put some nice, squirmy hoses all over the thing, which means it’d look real good in a diorama. Or in the playset whence came this particular variation. What’s this!?! (he said, sounding like William Dozier). Well, it’s a tease for the new pics in Big Tractor Mike’s gallery. So, you know, head over there when you’re done here. Needing info on this KubelWagen. Well, well, well… Let’s see what Kenny got himself this time. The ’63 Studebaker Champ pick-up, very nice. (I din’t know Studie even made pickups.) Constructicon Scraper, from the new Transfomers movie (um, no, wait…). And, yes, a garbage truck! 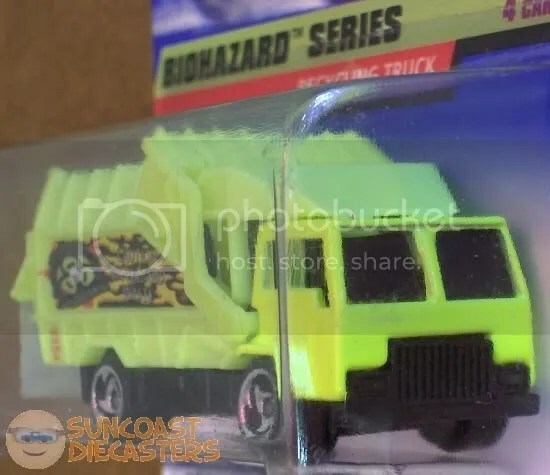 I mean, an actual garbage truck this time, not a “recycling” truck!. You can clearly see in the photo, it says “rbage truck” (yes, I framed the photo poorly). Oh, I know it says “Go Green” on the side, but I’m not lettin’ any pansy enviro-ganda take away from Ken’s victory. Ooh, look! Another garbage turck! Ken’s doin’ all right for himself here. I’d tell you about the oher vehicles in this shot, but I don’t have any info on ’em. Jeff brought his amazing collection, among which was a box full of Kenner Fast111s. I looked it over, immediately tempted to buy the whole thing. Taking a breath and taking more time, I selected only those which were either previously unseen by me or were variations or duplicates of singles. Clockwise from left, there’s Pipe ‘N Hot w’ blue-on-yellow tampos; maroon Dizzy Lizzy (I have the blue one); white Blazin’ Bandit w’ black plastic base (I have the black one w’ chrome base); Super Coupe; Stock Shocker; Cruiser Bruiser; maroon Saturn Seeker (I have three white ones); Pipe ‘N Hot w’ red-on-blue tampos; and center stage is Jet Screamer. Marge, bless her heart, had a bargain sale: many of her usually “collector priced” cars were marked down to $1.00 each! So, yes, I went a-huntin’. Ended up with ten great cars. Clockwise from left: Packin’ Pacer (’81 Hot Ones); JL ’77 AMC Pacer; ’32 Ford Highboy, in WCW La Parka livery (Racing Champions); MB NASA Tracking Vehicle (a bittersweet treasure, now that our Shuttle program is getting canned); Vantastic (MD SuperFast, England); Kidco “Turno Vette” (so says the tampo; simple wheels and featureless base, but the body casting is very nice — and it’s not a Key Car! ); Jack “Rabbit” Special (yep, from the Redline era! ); and center stage is the Batmobile. It’s a Corgi Junior, with Whizz Wheels, from the mythical land of Gt. Britain. Jim had several bags of cars, labeled “free”; well, if that’s not an invitation, I don’t know what is! 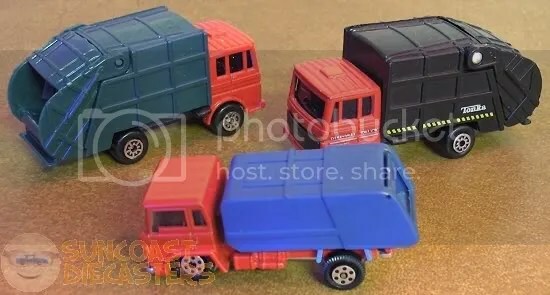 Thus, I ended up with these four beauties: Blue Street Boss (I have the black one) and orange Turbo Tram (I have two chrome ones), both Kenner Fast111s; TootsieToy moon buggy (nope, I can’t explain the trailer hitch); and Ford Pickup, by Zylmex. By the way, this Zee p’up is the same model Ken acquired at our December ’09 meeting; just different color & tampos. The green fellow on the left is the Cougar Villager wagon (Matchbox SuperFast, England). The silver truck is, and I’m simply going to quote here, “Fun Trucking Courier”, by Zylmex. 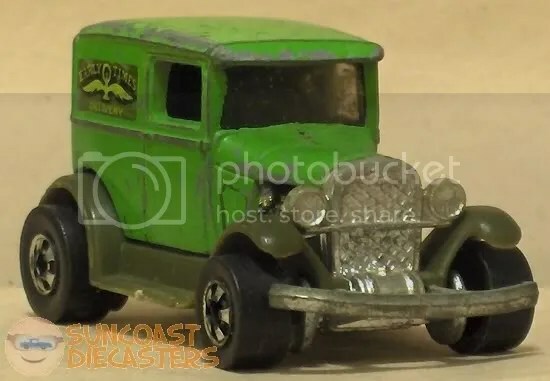 According to the Zylmex Tribute Page (see Links), the Courier is from Zee’s ’79 Rough Riders series, as are Ken and my Ford p’ups. Now, what I can’t tell you is, which is which. That is, one of these came from Jim’s free baggage, and the other is from Marge’s dollar sale. The Courier is probably from the sale, but I’m not sure. So, at this point you may be wondering, where is the tenth car? I said I got ten cars from Marge. There are eight in that photo. One of the cars above is from Marge; that’s nine. So … where’s the tenth one? Well, here it is right here! It’s a 1932-ish Ford kind of a thing, made by Universal (I think). Light blue with flames. After I paid Marge, I showed my new treasures to Ken. He looked at the Ford and said, “I’d buy that for a dollar!” So, much to his surprise, I sold it to him right then and there. Now, if only I had remembered to photograph it before we left the meeting…. Bill’s good buddy Tom joined us at the March meeting. Tom is a total VW nut, as these photos prove. Heck, he bought four from me alone! In this photo, he has the Mod Bod series and Biff! Bam! Boom! 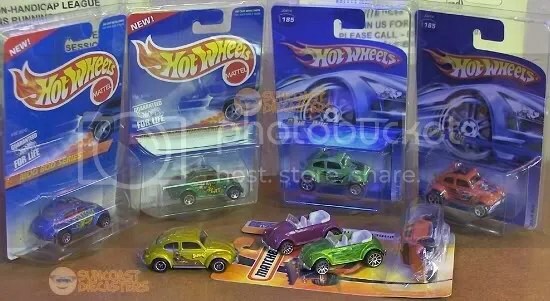 series VW Bugs; both the orange and green versions of the Kar Keepers-exclusive Baja Bug; both Mystery VW Convertibles; as well as the regular and Scooby Doo! 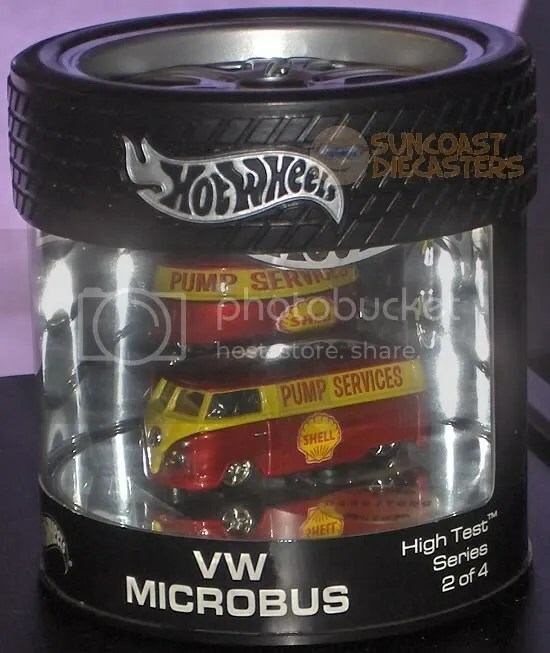 Matchbox VWs. And in this here photo, Tom has the MicroMachines Volkswagens set (which, for the record, includes a Cabriolet, a Karmann Ghia, a Microbus, a VW Beetle and a Beetle Convertible); a V-Dubs ’62 Volkswagen Bus; another Baja Beetle; a Matchbox Volkswagen T2 Bus; and the Smokey and the Bandit Pontiac Trans Am, which … um … hmmm…. Ken scores incredibly well with this ’66 Malibu Streetrat (Yatming), as well as this Nissan 300ZX, which is the rare Getty Gas Station promo. 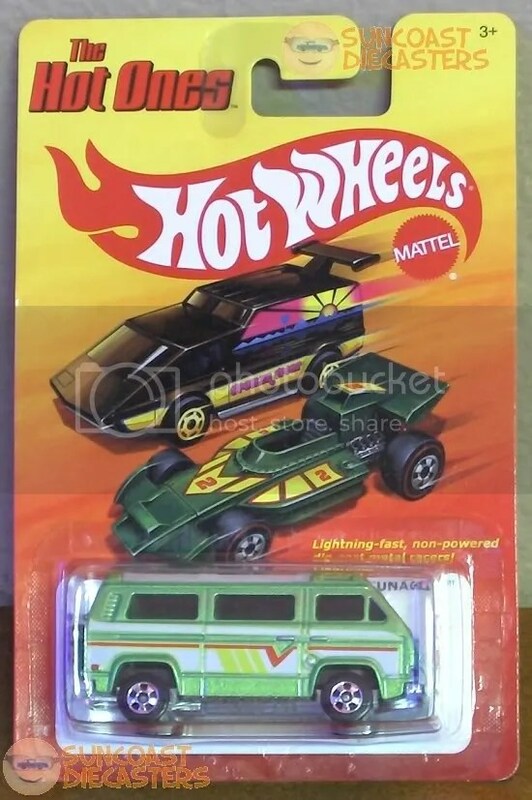 It’s also stunningly rare to see an ’84 Hot Wheels with opening doors! From Frank’s vast collection, I nabbed this rare and wonderful Dizzy Lizzy. 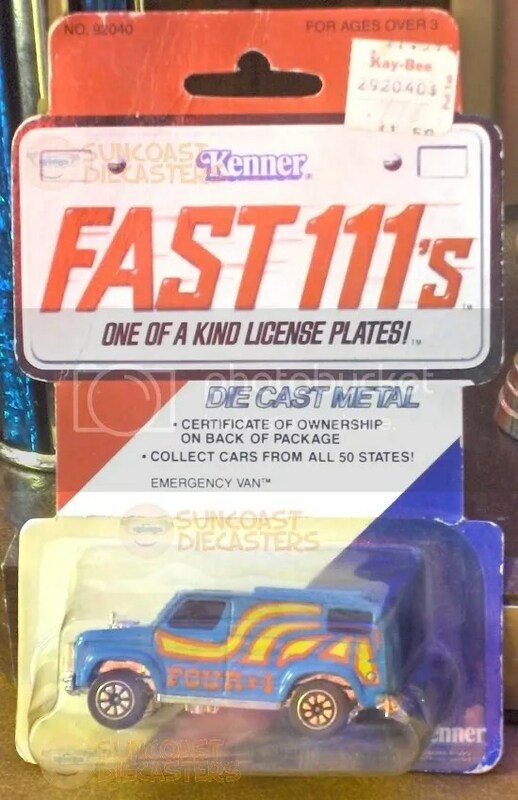 And, yes, as you can see by the license plate in the inset, it’s from Kenner’s Fast111s line. 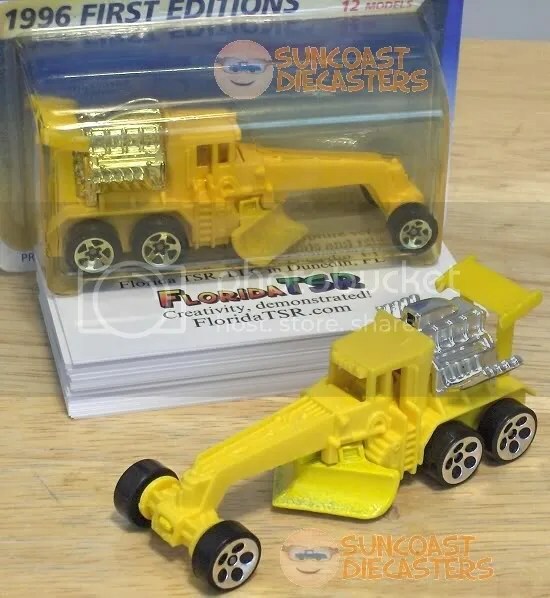 Man, I’m so glad I’m a member of Suncoast Diecasters, for I sure do enjoy finding these KF111s at our meetings. (By the way: while I guess one could broadly use the term “Lizzy” to describe any car, this model certainly doesn’t bear any resemblance to the classic Tin Lizzy. Our “belated” 2011 Gallery starts out with a call-back to our 2007 Gallery: Big Rob’s Ranchero. Rob treated hisself to the Classics versions. I RAOK’d him with the Holiday Hot Rods version. I purchased this way-radicalized ’57 Roadster from Rob. I wasn’t sure if I still had mine, so I bought this’n as either a replacement or a spare. Turns out it’s a spare; I found my original one recently. However, Ken got his cool factor back with this groovy Zee (Zylmex) Chevy Nomad. I apologize for this photo being rather grainy. The plastic shell prevented me from getting good focus on the car itself, so I had to up the sharpness more than usual to make the car stand out. 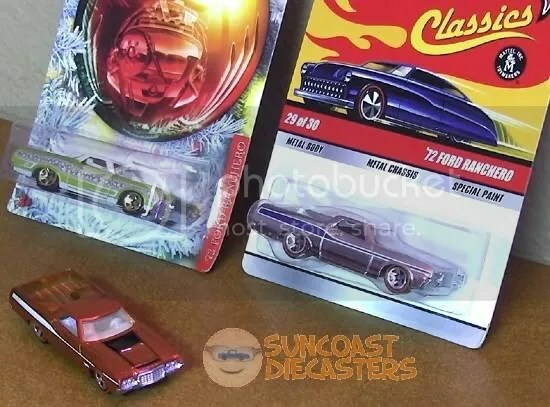 Ken further ups his coolism with this trio of treasures: T-Totaller (Speed Machines series); ’56 Crown Victoria (ERTL); and a Jaguar XKE from Monogram’s 1/87th-scale Mini Exacts series (which info also came from our new top Link). And with these two, Ken reaches a level of coolness deserving of a title: King of Koolness for the Month of February 2011, a title I just made up. 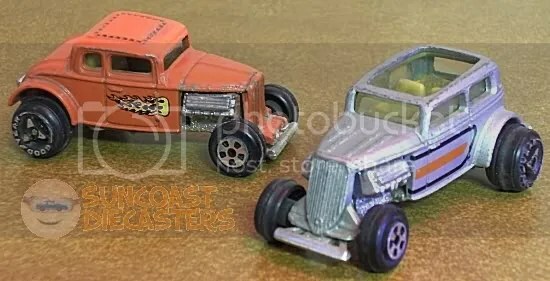 The orange one is a ’32 Ford Coupe street rod; the silver one is a ’34 Ford Sedan street rod. 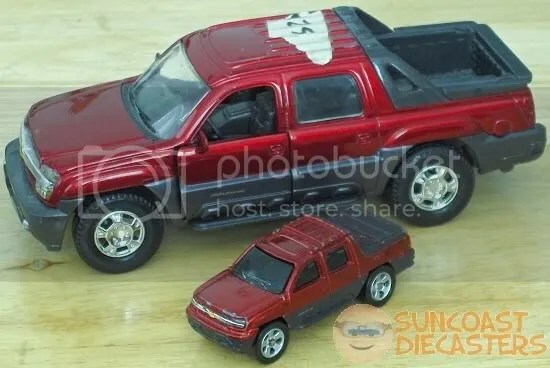 Both Ertl; both of which (also the Crown Vic above) came from Big Tractor Mike. Stop bein’ so cool, Ken; it’s gettin’ frosty in here! The 1955 Lincoln Futura, courtesy Jim. A well-known concept car, exemplifying the “jet age” design aesthetic. 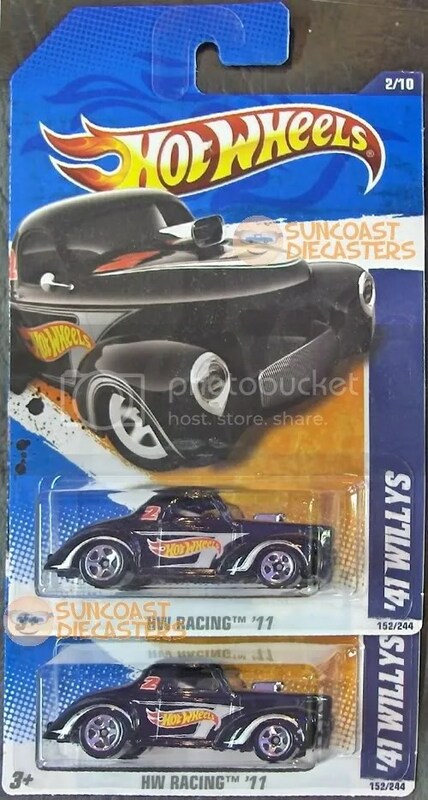 A wonderful car to add to my collection. In 1966 Barris was requested to design a theme car for the Batman television series. Barris then contracted stylist Dean Jeffries to build a car for the show … but when the studio wanted the car faster than he could deliver, he turned it back to George Barris. 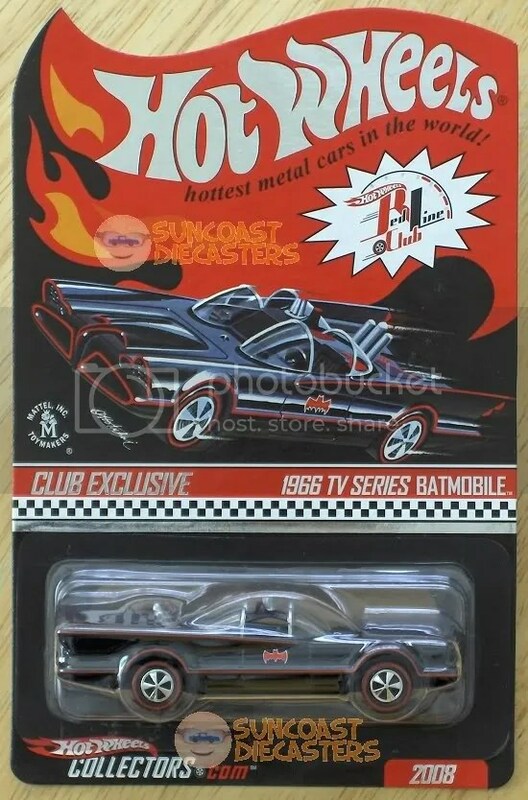 With the short notice, Barris thought the Futura might work well, and using Jeffries’ initial car, decided that its unusual winged shape would be an ideal starting point for the Batmobile … After its conversion to the Batmobile Barris continued to retain ownership of the car … the original Futura became the Batmobile…. Thus is the legacy of this literal one-of-a-kind dream machine: a single shot at fame in a movie; then sold to Barris for the humiliating price of $1.00; then transfigured into a themed vehicle for a campy TV show … from which it garnered a level of fame and fan appreciation that lasts to this very day.